Yudonosan, or Mount Yudono, is one of the Three Mountains of Dewa (today's Yamagata Prefecture). Yudonosan symbolizes rebirth and has one of the holiest shrines in Japan. In 1997, a monument to remember the Kaiten Special Attack Corps members who died in battle along with the spirits of other war dead from the Pacific War was erected to the right of the large torii gate that leads to Yudonosan Jinja (Shrine). 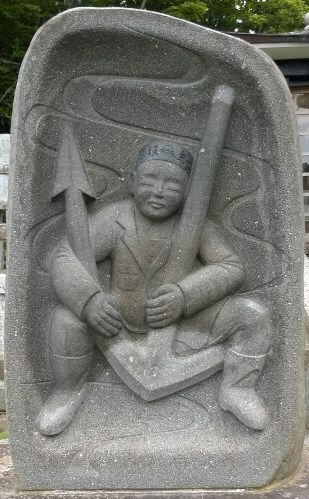 The monument has the image of a kaiten human torpedo pilot who is holding an anchor. A memorial service is held there annually on July 20. The Greater East Asia War was an extraordinarily great war in history with the concerted efforts of the country and its people. In the latter part of the war many youths, beginning with students, volunteered and participated in the war. The war moved to the land, sea, and sky everywhere in Asia. Among the youths, there were those who died voluntarily as members of the Special Attack Corps as they desired security for the country and their countrymen. Those brave heroes became the foundation that supports peace like an "anchor" keeping a ship safe. 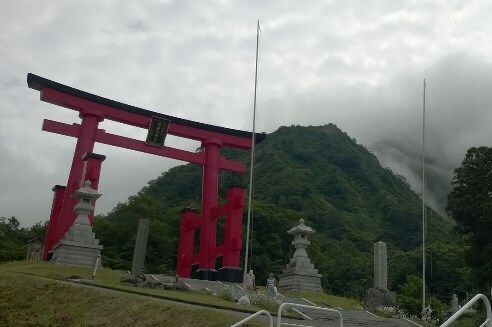 In 1979, we erected a monument at the summit of Mount Gassan  in the presence of the deity Tsukuyomi (moon god in Shinto mythology) to honor the courageous heroes together with the many spirits of the war dead. Each year at noon on August 15, we hold a ceremony there for the repose of their souls. Already more than fifty years after the war's end, among the Japanese people who are accustomed to peace, both the horrors of war and the ardent wishes of the many spirits of the war dead have been forgotten, and morals have gone out of fashion, so it is troubling for tomorrow's Japan. Also, everywhere in the world conflicts have not stopped, and the path to worldwide peace still seems a long way off. We ask that the spirits of the war dead, said to number 3.1 million, be purified and reborn with the sacred hot springs water of Yudonosan and that they work to guide us towards peace. 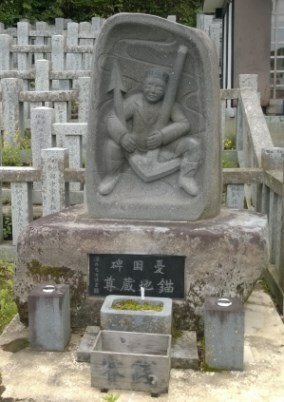 With the desire for eternal world peace, we erect this "Ikari (Anchor) Jizo Statue" and place here, as representative of the war dead, a copy of Sono wakaki inochi oshimazu (Those youths who did not care about losing their lives) , a collection of last writings of the Kamishio  Special Attack Corps, and coral from the Ulithi Islands and sacred stones from Okinawa where fierce battles were fought. 1. Mount Gassan, like Mount Yudono, is one of the Three Mountains of Dewa. 2. This book, published in 1978, was written by Hogara Miyoshi, a newspaper journalist with Asahi Shimbun who worked for the Navy as a correspondent during the Pacific War.